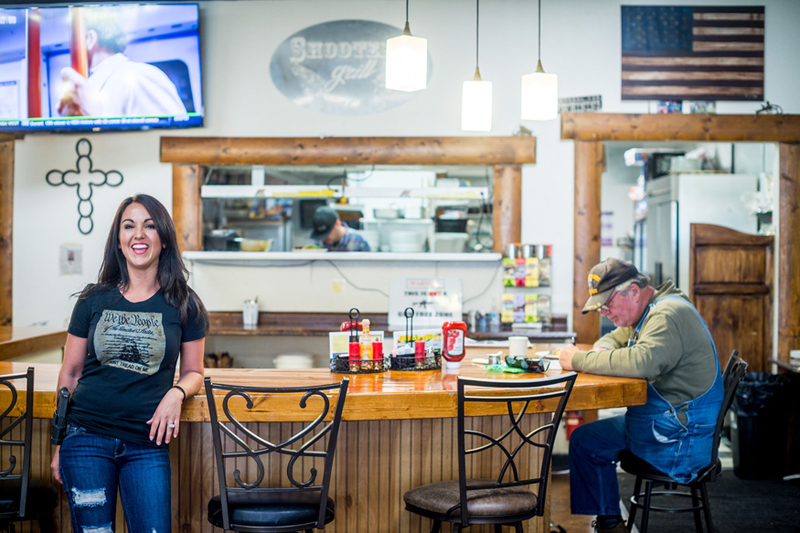 Shooters Grill owner Lauren Boebert opened the restaurant with her husband, Jason, in 2013. The kitchen at Shooters Grill is not the only thing packing heat. The waitresses do too. And so do many of the customers. "Guns are welcome on premises," reads a sign on the front door of the burger joint in the aptly-named Colorado town of Rifle -- population, 9,500. "Warning: This is not a gun free zone," reads a sign in the wood-paneled restaurant. "God Bless America," says another. Six-shooters and rifles adorn the walls along with American flag imagery and pictures of Hollywood cowboy icon John Wayne. Shooters Grill owner Lauren Boebert opened the restaurant with her husband, Jason, in 2013. Shortly after the opening, a man was beaten to death nearby and Boebert said she began questioning how to keep herself and her employees safe. "What do I do to protect me and my people?" she said. "I could call the police but would they even come out in time?" Boebert said she sought advice from Edward Wilks, the owner of the Tradesmen gun store and pawn shop located conveniently next door. Wilks explained that Colorado was an "open carry" state allowing for certain firearms to be carried openly. She said she started strapping on a gun, a Taurus Judge revolver, the next day. "It just felt right," she said. "The customers didn't bat an eye." Several of her waitresses asked her a few weeks later if they could carry a gun as well, Boebert said. That eventually evolved into the "open carry" theme which characterizes the restaurant today. "It wasn't supposed to be a gimmick," Boebert said. "It was just about protecting you and us." Jessie Spaulding, a Shooters waitress with a nose ring and a pink headband, wears a pistol holstered on her hip as she serves customers their burgers and fries. The gun theme even carries over to the menu, which offers a Swiss & Wesson burger with sauteed onions, mushrooms and Swiss cheese for $11.99. There's also the Guac 9 burger, which comes with "Glock-a-mole," also for $11.99. Those not in the mood for a burger could go for the Ruger Reuben, a corned beef sandwich, for $12.49.